This past Thursday evening, I found my way to the Cheltenham branch of Cineworld to see Alien: Covenant, which is probably my most anticipated film of this year (mostly because the idea of a sequel to Blade Runner – my favourite film of all time – fills me with almost equal amounts of delight and concern; I wasn’t nearly as concerned about Alien: Covenant). I went with my old mate Alan, and we had opted to see the film in IMAX, which I have to say in retrospect was an eminently sensible decision. I lucked out and got almost perfect seats, pretty much dead centre, and purely in terms of visuals and sonics the film totally delivered. It’s an immersive film and really benefits from the added bells and whistles of the IMAX experience. At this point, I should warn those who haven’t seen the film yet, and who might not want any plot points spoiled for them before seeing the film, that there are multiple spoilers ahead. It seems that Alien: Covenant has been very well received overall – certainly by the media, judging from the print reviews I’ve seen. After the very mixed reaction that the last three entries in the series received (I’m not treating the Alien vs Predator films as part of the Alien canon, and neither should you – not least because they directly contradict aspects of the other films). The reaction from sci-fi fans, however, have been much more mixed. I say “sci-fi fans” rather than “fans of the series”, because as with so many spheres of fandom, the latter group are often so totally at odds with how they view the films that it’s hard to say what “fans of the series” really are. Although Alien series fandom falls into a bewildering array of sub-groups, they fall broadly into two categories: those who love the original two films, Ridley Scott’s Alien and James Cameron’s Aliens, but have real problems with the other entries in the series, and those who like all of the films to greater or lesser degrees. Within these groups there is a variety of subdivisions: for instance, I know at least one guy who swears that everything other than the original Alien is utterly worthless, and Aliens is actually worst of the lot; and another fan of Aliens specifically, who feels the other films all lack excitement. Similarly, with the fans who like all of the films, there are those who really rate some of the films above the others, or just dislike one entry intensely and like the others. So it goes with fandom of all stripes, I guess. I’ve noticed – and this is a generalization, I know, but my own experience seems to bear it out for the most part – that it’s the first group, who really like Alien and Aliens, who have been lining up to give Ridley Scott a hard time for his prequel films, Prometheus and now Alien: Covenant. There are a long list of complaints about how Scott has scripted his prequels (not to mention a long list of complaints about Alien 3 and Alien: Resurrection, the earlier sequels). Most of them seem upset that in addressing the origins of the aliens, Scott is somehow demystifying the aliens – to that concern I would merely point out that the aliens have still evolved as we must have assumed they did in the first place; it’s just that now we know that that evolution was directed. This is one of the chief plot elements in Scott’s prequels: just as many humans have believed since time immemorial that their evolution – or creation, if you prefer – was directed by an intelligence, so the evolution of the aliens is being directed. Whilst it’s obviously a matter of preference if this idea interests you or not, I think it’s a bit short-sighted to dismiss Scott’s theme before knowing where it’s going to take the films. Given the subtext throughout all of the films about birth/rebirth/evolution/adaptation, and the treatment a given group of characters receives from its creators, I personally find it intriguing. In Alien: Covenant, we’re shown that Weyland and his company create David, the ‘synthetic human’, yet it’s not long after David becomes functional that he points out that he will likely be functional long after Weyland and the engineers that built his kind are dead. The clear subtext is that David is wondering why he appears to exist to do the bidding of creators who are inferior to him. The crew’s conversation with Ash, the “malfunctioning” synthetic from the original Alien, seems to indicate that Ash appears to have come to similar conclusions. The central plot point, that David’s manipulation of the biological substance developed by the Engineers resulted in the creation of the aliens – who Ash (and others) later admire as almost “perfect organisms” – by a being that we created, is an irony that I hope is not lost on viewers. Many detractors of the prequels also make frequent assertions about Scott’s prequel organisms not directly mapping onto the aliens we see in Alien and Aliens. Quite apart from the fact that the aliens are demonstrably biologically adaptive – witness the rather different make-up and behaviours exhibited by the alien in Alien 3, which emerged from a dog (or a cow, depending which version of the film you prefer) rather than a human being – this completely avoids dealing with the evolution of the creatures thanks to David’s meddling. Any apparent “discrepancies” between the aliens of the prequels and the other (chronologically later) films can easily be explained away by David’s tinkering; this is so plainly Scott’s intent that I’m surprised that it needs to be explained to anyone. However, all this is minutiae compared with the most fundamental misunderstanding that some seem to harbour about Scott’s additions to the series. The original Alien – much like H. G. Wells’ The War Of The Worlds and numerous other works of science fiction since – is an assault on human self-satisfaction, and a reminder that we are a very small, even totally insignificant, element in a vast, dangerous environment: space. As we’ve heard many times from people involved with the space programme, there’s no environment more hazardous or inimical to human life than space. 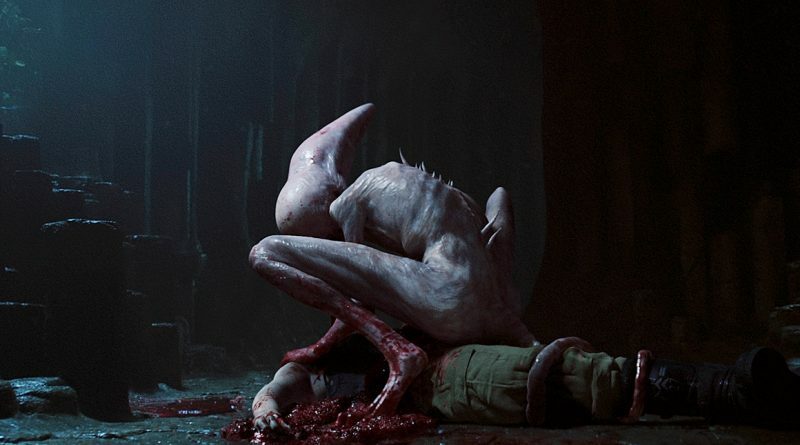 Scott’s original Alien has a much larger subtext than a killing spree by an alien creature that could not be understood or reasoned with: it exploited our fear of the unknown, of the dangers and as-yet undiscovered hazards that space represents as the ‘final frontier’ (sorry) of human exploration. Unlike our planet, or even the other worlds in our solar system, space in its vast entirety will never be fully mapped and explored: there’ll always be stuff out there that will be completely unknown to us unless we somehow happen across it. Part of the success of Alien is that it happens off-world, far from any help, in a deeply hostile environment which is inimical to us but which the alien seems equipped to survive in. In this respect, it mirrors hugely influential stories like Lovecraft’s At The Mountains Of Madness (which actually maps neatly onto the plots of those first two films to a large degree) or John W. Campbell’s Who Goes There?, best remembered as the inspiration for John Carpenter’s unforgettable The Thing (which also shares storytelling elements from At The Mountains Of Madness, not least its setting). What I’m driving at here is that the Alien series is, at heart, a gothic horror: Scott has merely relocated it to space, an environment even more hostile than anything set on Earth could be. There’s a central idea that, to mirror Dr. Leonard McCoy’s comment from JJ Abram’s 2009 Star Trek reboot, “space is disease and danger wrapped in darkness and silence.” It’s an environment that we simply can never conquer, merely survive – and then only if we’re lucky. Our subject lesson is we can never be truly prepared for what we find out there; the odds are stacked against us, and it’s the natural existential fear of that fact that makes the Alien series tick. The whole series is designed to keep us from feeling safe, and this is the sole flaw of Cameron’s Aliens: that however adept he was at keeping the unexpected scares and problems coming, he left the film on a comfortable note with the surviving characters safe in their cryopods. This is something that David Fincher, as director of Alien 3, was immediately obliged to address when making his film. Many fans of Aliens rail against the cold way that Newt and Hicks were killed in the opening minutes of Alien 3, failing to realize that there was never any way that they could return home to a normal existence. We as viewers needed to be shown that there was no chance of a happy ending: there simply aren’t any happy endings in this series. There can’t be; it would be contrary to the entire point that Scott has been attempting to put across. This is why I firmly believe that Fincher is the only director of a film in the series, other than Scott himself, that truly understood what Scott was attempting to do. We’re meant to be disturbed by the death of Newt and Hicks. We’re meant to feel that theirs was a pointless, random demise. We’re meant to feel that it was unfair, just as most of the deaths in the various films are fairly random, sudden events. No-one is safe; we are not safe. Fincher understood that; some fans, for the most part, have singularly failed to grasp this. And so it is with Alien: Covenant. Branson’s sudden, disturbing and random death – “safe” in his cryopod – should prepare viewers for a reinforcement of this idea, but instead some viwers merely question his “senseless” death. That’s the whole point, folks. Likewise the way that Faris endangers the entire expedition by merely attempting to survive, or the way the film fails to look away during almost any of the death scenes. For another theme of the Alien series is pure body horror: you’ll notice that all of the characters come to quite different albeit bloody ends. This is Scott reminding us of just how fragile we are. “What’s the worst thing you can imagine happening to you out there in space?”, asks Scott, and then proceeds to show us. This, as much as the story of the aliens’ genesis, is at the heart of the series. I feel that to look askance at the nature of these deaths is to miss the point somewhat. Anyway, this is all largely academic. Those who’ve seen the film will have arrived at their own verdicts for any variety of reasons, not just the ones I’ve described here. I can’t shake the feeling, though, that for many, the various subtexts are either overlooked, or are just not to their tastes. Which is fine, but I hope that they can understand why the much-touted ideas of director Neill Blomkamp to at least partially “reboot” the series with a film based on ideas that seemed utterly at odds with Scott’s established themes, the very things that make the films work so well, were greeted with such horror by some of us. For me, certainly, the idea of ignoring the events of Alien 3 is completely at odds with the very existence of the series. If Blomkamp does get to make his film for those who’d prefer a cosier, reassuring resolution for characters they enjoyed then so be it, but I certainly won’t be queuing up to see it, and I know I won’t be alone. If David’s story arc has proven anything, it’s that too much meddling almost never has a happy ending.